My experience with Di-Drive was fantastic and I could never summarise how grateful I am. The skills I learnt are invaluable. Not only does the professional tuition prepare you thoroughly for your test, but it also develops you as a driver. Di installs you with confidence and really helps you overcome any weak areas you may have. I still remember the diagrams, handouts and clear explanations I received whilst taking my lessons and how useful the different methods of teaching were. Di just a big thank you for getting me through my test with a pass at the end. You said you would get me through it and you did. I had failed my test 3 times before with a different instructor and I hadn't been having my lessons that long with Di before I passed first time. I always felt at ease and comfortable with di and even when I did stupid things she would never be annoyed but had the patience of a saint .If you want to pass your test you will with Di. She's a brilliant friendly caring instructor who will help you achieve anything. Just one more thing Di - even now when I'm driving I still hear you saying “mirrors, mirrors” and I still have the little Di on my shoulder shouting blind spot! Di-Drive was recommended to me by two of my friends who, not only both passed first time with Di, but also found her methods of teaching to be fantastic. Booking my first lesson with Di is one of the best decisions I made. Di is a fantastic teacher. She explains things clearly, for example her approach to teaching driving manoeuvre’s (which I have always struggled with!) is simple, easy to understand and more importantly work!! Di always gave me positive feedback at the end of EVERY lesson, so even when I gave myself a hard time, for example if I'd had a lesson where I felt Id made lots of silly mistakes, Di would always point out the things that I did right and remind me of my strengths. She had a belief in me that I sometimes found difficult to find myself! Di is definitely NOT one of those instructors who is just 'in it for the money' In fact when Di told me it was time to put in for my test I thought I could do with having more lessons!! However, she assured me that I was ready and capable of passing (again, always having confidence in me) She has a genuine passion for driving herself and I have no doubt that seeing her students develop into good, safe drivers and pass their test, is the most important thing for Di. I can honestly say that I don't think I would have passed with anyone else. I would, have, and will continue to, recommend Di-Drive to anyone and everyone! Just a small note to say a massive “thank you” for all your expertise and support. You have been a fantastic instructor and have kept me going when I thought I was wasting my time! Thanks again. I just wanted to put into writing how happy I was with my whole experience of Di-Drive. You're entire approach from the start is 100% professional, the way in which you run the business, the cleanliness and tidyness of the car, the planning and timing of all the lessons are all faultless. There was never any overlap on timing or rush at the end of a lesson, in fact on several occasions I know my lessons were definitely longer than scheduled, (talk about value for money!). You achieve it in such a friendly way, and automatically instil confidence. I would have no hesitation whatsoever in recommending you to anybody. 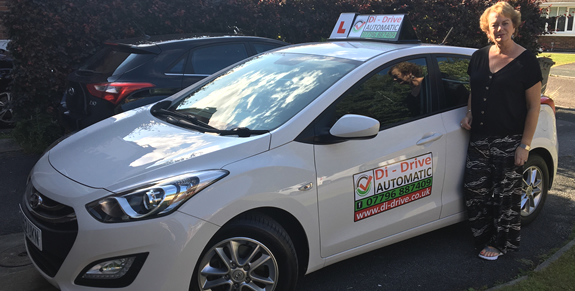 I had taken my driving test 5 times BEFORE I started driving with Di-Drive – when I passed on my 6th attempt. I recommend Di-Drive to any other learners. I found that Di was an excellent tutor ( and I should know! ) – she was good at explaining things and egging me on if I lost my confidence. Thanks Di for enabling me to finally pass my driving test!